By default, the Event Editor will load the data from the version used when publishing the map service. The version name is displayed on the Edit tab. You may want to change the enterprise geodatabase version to perform edits in the particular version to keep your edits separate until you're ready to post to the appropriate version. The version needs to be public before you can change to it. 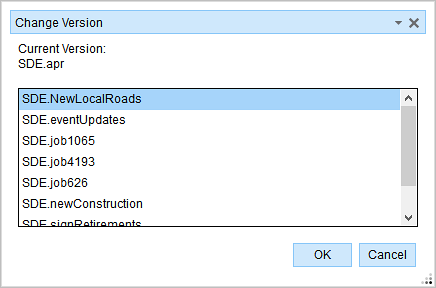 You can change from one enterprise geodatabase version to another using this functionality. The ability to change a version is based on your deployment's configuration and may not be available for your deployment. For details on configuring the option to change versions, see Configuring the Event Editor web application. Use the following the steps to change between versions. In the Versioning group, click the Change Version button. The Change Version dialog box appears. A list of the public versions available to change your version to is displayed. If you want to create a child version for your edits, see Creating versions. If a new version is created outside the Event Editor session, you may need to close and reopen the Change Version dialog box to see that version in the list. Choose a version from the list. This will change the version for Event Editor. You may get a warning if you have a selection or unsaved edits present in the current session.